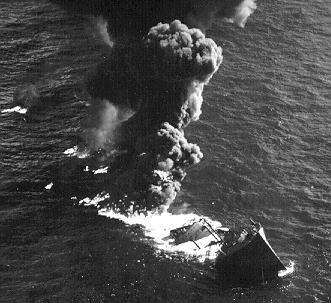 Torpedoed by a German U- boat, the U-66 on January 23, 1942 off Cape Hatteras at 7:45 pm. The Empire Gem was struck by two torpedoes as she approached the Diamond Shoals light buoy heading north, she overtook the U.S.freighter Venore shortly before being hit on her starboard side by the U-66s'' torpedoes. The ship burst into flames almost immediately and then sank while ablaze. Only two sailors from the all-British crew survived the sinking, Captain Francis Broad and the wireless operator, 49 others perished while transporting almost 11,000 tons of gasoline and over 900 tons of equipment to the war effort in Europe. The S.S.Venore was sunk by the U-66 only minutes following the attack on the Empire Gem. She was hit by two torpedoes killing 19 of the 22 crew members. The MV Empire Gem was less than a year old when it was sunk. The tanker was traveling from Port Arthur, TX carrying 10,600 tons of gasoline. It´s ultimate destination was the United Kingdom by way of Halifax, Nova Scotia. A veteran of the Atlantic convoys, the tanker was armed with a stern-mounted 4 in. gun, several machines guns and a 12 pound anti-aircraft gun. The Empire Gem had been travelin g up the coast in a zig-zag course and overtook the bulk-ore carrier Venore just as the ships were entering the Diamond Shoals area.